(CCCB – Ottawa)... The Most Reverend Jacques Landriault, Bishop Emeritus of Timmins, died on 6 November 2017, in Ottawa, at the age of 96. 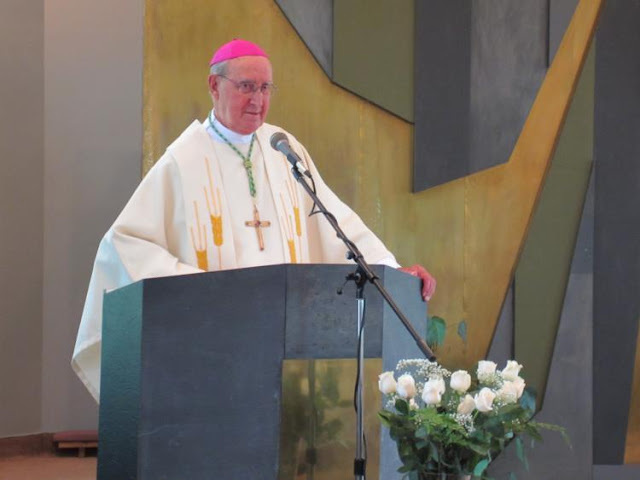 After 19 years as Bishop of the Diocese of Timmins, he had submitted his resignation to the Holy Father for health issues and this was accepted on 13 December 1990. Bishop Landriault was born on 23 September 1921, in Alfred, Ontario. He was ordained a priest in 1947 for the Diocese of Timmins. On 15 May 1962, he was appointed Auxiliary Bishop of the Diocese of Alexandria-Cornwall. Two years later, he was appointed Bishop of the Diocese of Hearst on 27 May 1964 and then Bishop of the Diocese of Timmins on 24 March 1971, while remaining Apostolic Administrator of Hearst from 1971 to 1973. As a member of the CCCB, Bishop Landriault served as member of the former Commission for Catholic Action and the Lay Apostolate (1966-1969), member of the former Commission for Christian Education of the French Sector (1966-1971 and 1989-1991), member of the Ad hoc Committee for the evaluation and restructuring of the CCCB (1967-1969), consultor for the then Office for Clergy (1969-1970), member of the former Commission for Institutes of Consecrated Life (1979-1983), and member of the then Commission for Liturgy for the French Sector (1979-1987).